It’s a rare gauge pod made especially for the Audi TT. It has apparently been designed by David Manseau. (A designer?) Anyhow, everywhere I look for it, its discontinued or out of stock. 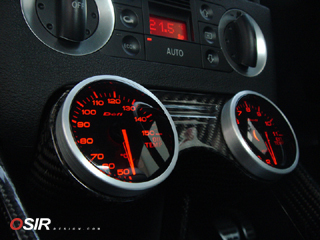 Pricing is about 250$ without the gauges. Osir Design Carbon Fiber Mantis has made a very good job here. Audi TT RS DTM Race Car – Look at the console 🙂 I like! This entry was posted in Audi TT MK1 and tagged Mantis, OSIR. Bookmark the permalink. la fibre de carbone, je possède une Nissan GTR2011 avec aucune fibre de carbone et elle est plus Rapide que beaucoup de bolide bourre de fibre.